Messengers describe the vehicle that delivers the messages. The most common delivery vehicle pretty much all of us are familiar with is email. As of this writing, email is the first and currently only messenger used by the messages system. Which is why we intentionally built the messages system so it would act more like a framework for being able to rapidly add different kinds of messengers and message types for Event Espresso. Currently there are 3 types of messengers: Email, HTML, and PDF. 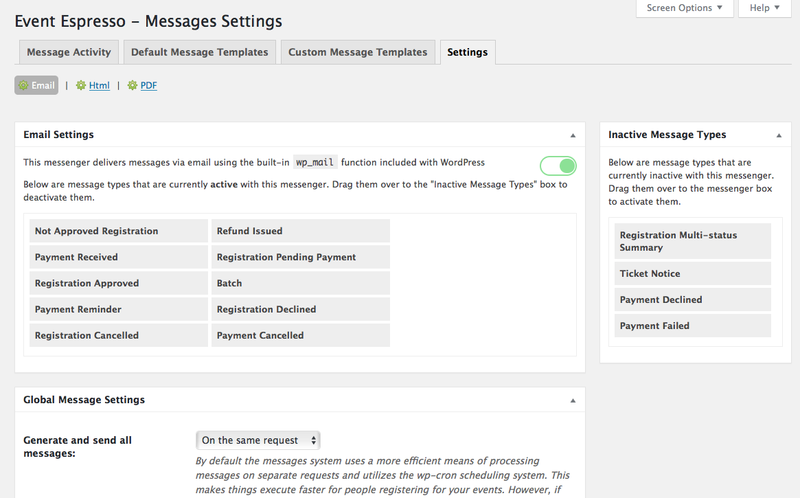 The Email messenger delivers email, and the HTML messenger generates the HTML Receipts, Invoices, and Tickets (available with the Ticketing add-on). You go to Event Espresso > Messages > Settings and click on the control. When the control is green, that means the messenger is activated. When the control is grey, that means the messenger is deactivated.